From Matteo Garrone, director of Gomorrah, comes Tale of Tales, a sprawling fable that’s a cross between the work of Terry Gilliam and Tarsem Singh. Based on the writing of Giambattista Basile, the film comprises three fairy tales about royalty, obsession and tragedy. 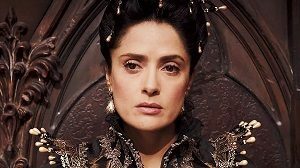 The Queen of Darkwood (Selma Hayek) is determined to have a child, no matter what the cost, and so the King (John C. Reilly) goes out to slay a sea monster. The King of Highmountain (Toby Jones) is so desperate to cling to his now adult daughter (Bebe Cave) that he puts his subjects to an impossible task – a task that one of them will accomplish. Finally, the lustful King of Stronghold (Vincent Cassel) becomes entranced by a mystery woman with a beautiful voice. The film is episodic in nature, moving back and forth between the three tales, and at 134 minutes, it’s not in any hurry. Thankfully, the film is a feast for the eyes. Most of it was filmed in real locations around Italy – castles, a stone labyrinth, a ravine, forests – and with digital set extensions, it’s truly impossible to tell what’s real and what isn’t. Being a $14 million film, of course the VFX aren’t flawless, but it does a lot more – proportionally – than Hollywood does with its $150 million-plus blockbusters. The performances are strong, but it’s Cave that really impresses as Violet, the daughter of the King of Highmountain. Her performance is so assured that, with her on screen, the usually problematic artifice slips away. It feels like she could have played the role of Yara in ‘Game of Thrones’, actually. I hope she goes onto bigger and better things. Unfortunately I only had the DVD to review, so I can’t speak to the quality of the HD picture. Given the spectacularly visual nature of the film, I would imagine the Blu-ray would be preferred. That being said, the DVD isn’t too shoddy, and the short interview pieces with the stars are enlightening. Tale of Tales might be too absorbed with the visuals to truly let the viewer in, but it’s a perfect film for those who think they’ve seen it all. A bold, creative yet flawed vision. Tale of Tales is available now on DVD and Blu-ray from Madman. This entry was posted in Film Reviews and tagged Drama, Fable, Fantasy, Tragedy by Stuart Wilson. Bookmark the permalink.